When I'm cooking, I have a tendency to focus on the main dish. For a side dish, I frequently find myself throwing together a mixed salad with bagged greens, tomatoes and avocados, which I toss in a dressing of olive oil and balsamic vinegar. It's a mindless effort. 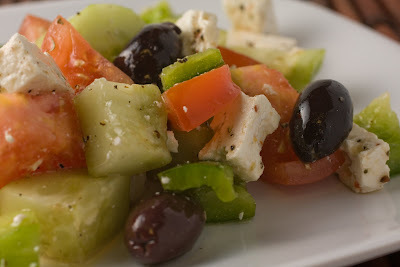 Last night, I made this simple Greek style side salad. I love cucumbers, and this was nice change-up from the usual. And I wrapped the leftovers in lavash bread to have for lunch this afternoon. Combine the dressing ingredients in a small bowl. In a large bowl, toss the vegetables, olives and cheese with the dressing and serve.